Size: 310 sq.ft. - 930 sq.ft. 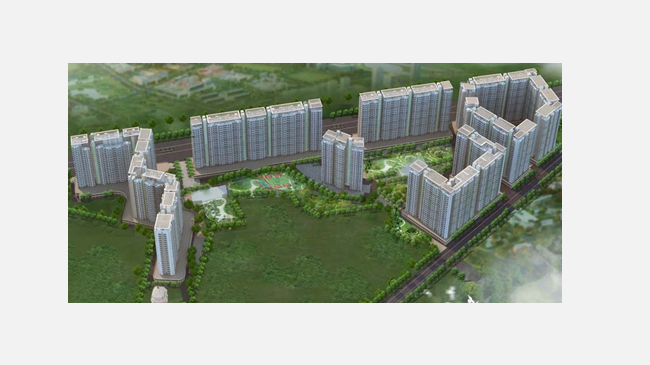 JP Infra developer is presenting a residential development over 27 acres landscape in Mira Road. JP Infra is having many facets as a construction company with a lineage of crafting high class residential projects in Maharashtra and Gujarat. JP North compromises of total 7 phases where 4 of the phases are already been launched with the name called JP North Elara(P51700007001), JP North Estella(P51700004117), JP North Atria(P51700004117), JP North Euphoria(P51700016290), JP North Celeste(P51700008667) and the other 3 towers will be launched soon. There are going to be 14 towers of 23 floors each with the layouts of 1 Bed, 2 Bed & 3 Bed internationally designed based apartments. JP North design is inspired by classical Spanish architecture that is most appealing to Indian taste. The construction work of these towers will be completed by 2019. Elara towers consists of 1 Bed and 2 Bed units, Estella consists of 1, 2 and 3 BHK semi furnished apartments, Atria consists of 1 and 2 BHK apartments, Celeste consists of 1 and 2 BHK apartments and the Euphoria tower houses 2 and 3 BHK iconic homes. These 1 to 3 BR homes are occupying the carpet areas of 455 Sq.ft to 1475 Sq.ft. 55 Lacs to 1.08 Crore. This project is going to house about 2500 apartments of various typologies. These homes are efficiently planned to define the balanced and good life of the residents. JP North will change inhabitants' life forever sits between a landscaped gardens, hills views, ample open area and state of art amenities. JP North project is located near Western Express Highway right between Bhayender and Mira Road stations. Mira Road, Mumbai is growing rapidly in terms of real estate developments and it is part of Mira Bhayander Municipal Corporation & houses. JP North project location has MBMT & TMT bus services and Mumbai Suburban Railways for convenient accessibility to nearby areas and reputed infrastructures. This location is most advantageous for students as it has wide range of colleges and schools. Mira Road is one of the perfect destinations to live in. Lodha Roads, Mira Bhayander road and Kashimira Flyover are major roadways that connect you to neighbouring areas of Mumbai city. JP Infra Pvt Ltd is a real estate firm was established in 10th March, 2006. This company is headquartered in Andheri East, Mumbai. JP Infra has delivered several residential projects in Mumbai both South & North locations and looking forward in expanding their business in other cities like Indore and Ahmedabad. JP Infra has 10 different branches worldwide with the employee strength of 5600. The company is aiming to transform Indian real estate spaces by redefining and establishing new benchmarks. Their powerful vision types of projects have given recognitions and awards. In coming years JP Infra will introduce more residential projects. Till date the developer has delivered Unity Towers, Dreamland, Chalet Amar and the under construction development are JP North, Altus, JP Decks and Boulevard. JP North community is near the landmark called Vinay Nagar at Kashimira, Mira Road East, Mumbai, Maharashtra - 401107. In JP North you will find leisure facilities as well amenities like - a Clubhouse with Multipurpose Court, Squash Court, Cafe, Library, Creche, Swimming pool, Kids pool & Ladies Pool, Meeting room, Table tennis, Indoor game room & Pool room, Gymnasium, Guest rooms, Mini theatre, Steam, Sauna and Spa, Banquet Hall & Multipurpose deck, Temple, Sewage Treatment Plant, Ring Wells, Community Garden, Fruit, Herbs & Spice garden, Astrological Garden, Yoga/Meditation Garden, Sculpture Garden, Toddler Garden, Butterfly Garden, Fitness garden, Maze garden, Zen Garden, Senior citizen Garden, High Speed Elevators, Joggers park, 4 & 2 wheelers parking area and a lot more. School/College(s) – Singapore International School, N.L Dalmia Institute of Management Studies & Research, Holy Cross Convent, Royal College, Holy Family School, St. Xavier's High School. Hospitals – Wockhardt Hospitals, Umrao Hospital, Seven Eleven Hospital, Doshi Hospital. Shopping Malls – Maxus Mall, Thakur Shopping Mall, Raghuleela Mall & Dmart. Business Centres – Infinity IT Park, Mindspace, G Corp Tech Park. Restaurants – Fountain Hotel, Dara’s Dhaba, Spice Garden.